This is the first article in which I take one of my ancestral families and attempt to reconstruct a narrative history. The Landes family was located in Romania in the second half of the nineteenth century. 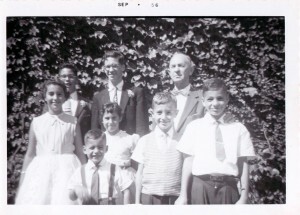 The family’s emigration trek would take them through Europe to England, and in North America, they lived in Montréal for some time before their final destinations in Detroit and New York City. 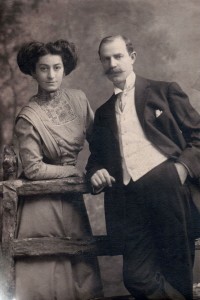 The first branch of the Landes family to arrive in North America included Martin Landes (1876-1951) and Paulina “Pearl” Yeruslavitz (1881-1966). They arrived in Canada in 1898 and married that same year. Martin was a traveling salesperson and frequently traveled between Montréal and Detroit. Other Landeses followed Martin to Canada. Martin’s brothers, Joseph and Charles Landes, and his sister, Fannie Landes, arrived in 1898 or 1899. His father and mother, Moses Landes and Bertha “Brauna” Yeruslavitz, who married in Iași, Romania in 1875, arrived in 1900. All Landeses other than Martin’s family came to reside permanently in Manhattan and Brooklyn within a few years. When they arrived in Canada in 1900, they traveled with a few other individuals. One seems to be listed as Sam Landes, and I haven’t been able to identify him. Another is Edith Yeruslavitz, who I believe to be Bertha’s mother, Eidil (as listed on Moses’s marriage certificate). I haven’t found a direct connection to Moses’s wife Bertha Yeruslavitz and Martin’s wife Paulina Yeruslavitz. There is a potential connection. Bertha had a brother named Moses Yeruslavitz, and this is also the name of Paulina’s father. The ages and the fact that both are listed as having lived in Valleyfield, Quebec make it likely these are the same individuals, but Bertha’s brother married Becky and Rosa, while Paulina’s mother’s name was Clara. Could Clara be Bertha’s brother’s third wife? While all the Landeses of this generation were born in Romania, there are some questions about where in Romania they lived. Martin, Joseph, Fannie, and Charles have documented that they were born in Iași, and thanks to the administrators of the JewishGen ROM-SIG (Romania Special Interest Group) community, I now have a few birth index records translated from Romanian as confirmation. I have no information about Moses and Bertha’s birth locations other than that they were born in Romania. Family lore indicates there may be an adoption, but that might just mean that the family arrived in Romania from Galicia and adopted the surname Landes when it became necessary to do so. Moses’s parents are Herș Landes and Perla Leah as listed on his marriage certificate, or Joseph Landes and Pauline Leon as listed on his death certificate. Martin’s family grew. He and Pearl had five or six children, all born in Montréal: Clara, Isaac, Irving, Grada Caroline, Molly, and Lillie. There is some confusion about Isaac and Irving. The evidence seems to show they were born over a year apart, but there are discrepancies pertaining to official dates. Irving Landes was born in 1904 and passed away in 1981, but his military records indicate he was born in August 1903, a year before other records indicate. This birth date would be too close to the official birth date of Isaac Landes, June 1903. The 1911 Canadian Census lists an Isidore Landes with the birth date of August 1903. Martin’s final child, Lillie, has a birth record and a listing in the 1901 Canadian Census, but no records pertaining exist beyond 1901. I expect that during sickness, the family began calling her Ruthie, which would then line up with the 1921 census and a cemetery record. Martin passed away in 1951 and Pearl passed away in 1966. Grada passed away in 1971, having never married. Irving, as already mentioned above, passed away in 1981. Clara Landes married Misha John Spiegel and passed away in 1996. Molly Landes married Israel Jack Cook and passed away in 2000. Before arriving in New York, Joseph studied pharmacology and/or medicine in Romania, possibly in Bacău. After settling in New York, Joseph Landes married Sadie Lustig (daughter of David Sturmwald) and had three children: Mortimer, Herbert, and Edith. Moses and Bertha continued to live in New York among their children until their deaths in 1926 and 1927 respectively. Mortimer (Morty) married Pearl Blush and Herbert married Marcia Kerstman. 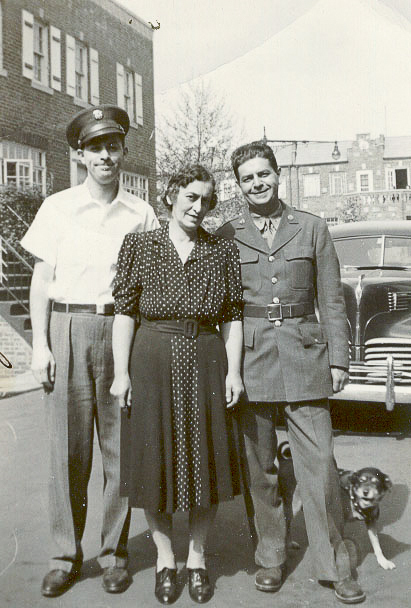 Joseph was a pharmacist in Manhattan, and the family business, including the ownership of a corner pharmacy in Brooklyn, was carried on by his wife and his sons Herbert and Mortimer. Charles was a salesman in a drug store. Herbert passed away in 1964, Edith passed away in 1986, and Morty passed away in 1993. Fannie Landes married Albert Paltiel. They had two children, Joseph and Harry, and Albert passed away. Fannie remarried, to Adolph Goldenberg, and they brought up the two children. Joseph married Hannah Paltiel and passed away in 1995, and Harry married Isabel Jackson and passed away in 1986. Charles Landes married Clara Schier (or Shear), and they had no children. Many people with the last name of Landes, some with alternative spellings, lived in New York after coming from Romania. At this point, I haven’t found any relationship between any other Landeses and my family. There are a number of unidentified family members. Moses’s obituary indicates he had a sister in Saint Louis, Missouri, who married a man named Cohen. When Moses and Bertha immigrated to Canada, they traveled with a Sam Landes, born about 1882, as mentioned above. Quite an impressive site! You and I are identical mtdna matches. We are also 3rd cousins autosomnally. You can see my family tree on Ancestry. My user name is 1snoe1. Although our maternal lineage is identical, I don’t see a connection. That doesn’t mean it isn’t there. I, too, have had trouble communicating with ‘cousin matches’. So I am reaching out to you as a potential cousin. We may match on more than one front, as my grandmother was born near Iasi, Romania. She is my paternal grandmother. Surnames are Ackerman and Solomon. You can reach me at sandeenoe@gmail.com if you would like to communicate. My brother and I are trying to go beyond the great grandparents we now know. He is about to take the Ydna test to cover that side of the tree. Hi, I am related to the Landes family from Falesti which is now in Moldova. Maybe connected? Hi I’m Jake Landes, I’ve been working on a family tree through ancestry and I found this website. I think I can add some pieces of information to the puzzle.